When communications app Slack first introduced Slack Actions in May 2018, users everywhere rejoiced. Suddenly you didn’t have to remember obscure ‘slash’ commands to integrate with apps like Evernote; it was as simple and painless as clicking a menu item. Now Zapier has joined the party, launching a set of Slack Actions that enable you to connect Evernote with your other favorite apps—such as Airtable, Todoist, and over 1,300 others—all from right within your Slack conversations. While we’d love to say that Evernote is the only app you’ll ever need, your information is probably spread across a variety of apps. In fact, research firm App Annie found the average smartphone owner uses 10 apps every day. That’s where Zapier comes in. It connects your apps by creating what it calls “Zaps,” automated workflows you can set up to share information between the apps you use most. 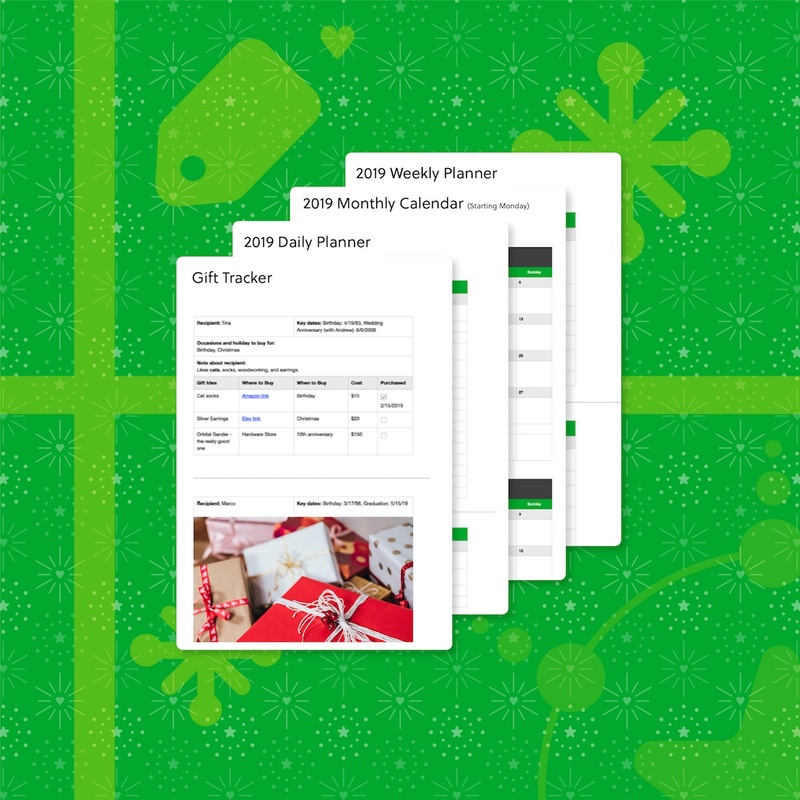 Some of the most popular Zaps for Evernote include connections with Google Calendar, Trello, Asana, and Dropbox, but there are hundreds more options as well. And we’re proud to say Evernote is one of the most popular apps among Zapier’s users. 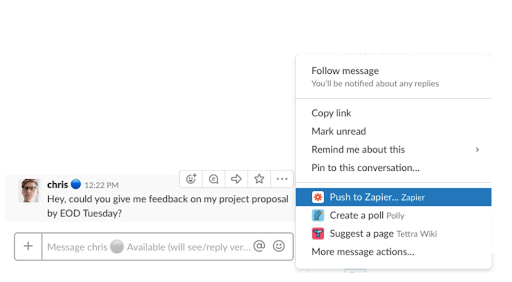 How is Zapier’s new Slack Action different? Previously, Zaps were triggered automatically when you took a specific action in Evernote or a connected app. For example, creating a reminder in Evernote might set off a process that generated a matching entry in Google Calendar (or vice versa). While you can still work this way, Zapier’s new Slack Action ups your game significantly. It automates the process of sharing information among multiple apps, so you won’t miss a beat. With this integration, you can send the contents of any Slack message—along with helpful information like channel name, username, and any optional text you add—to Evernote to create a new note, append to an existing note, or create a tag. You can then log that message to an Airtable database, create a task in Todoist, and more—all in one fell swoop. 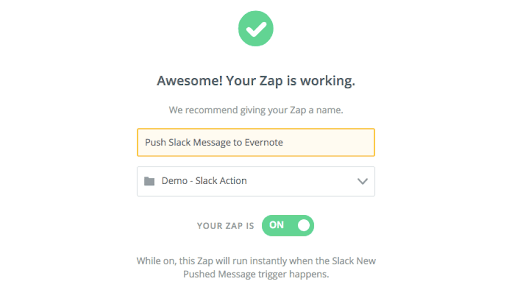 After you create a Zapier account and connect it to Evernote, set up a new Zap using the Slack “New Pushed Message” as a trigger. Then select an Evernote action, like “Append to Note” or “Create Note.” If it’s a multi-step Zap, select any additional actions such as “Create a Record” in Airtable or “Create a Task” in Todoist. Give your Zap a name then turn it on! A dialog will pop up asking which Zap you want to run. 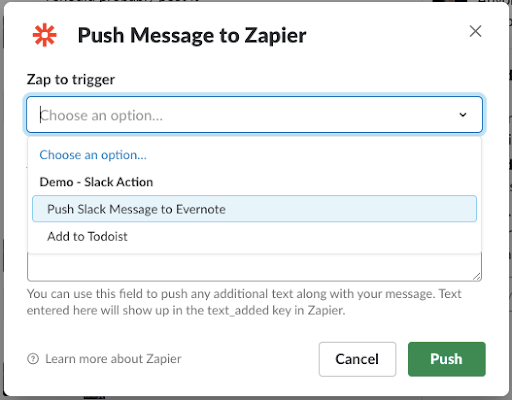 Select the Zap you created earlier and click “Push.” Zapier will send the contents of the Slack message to Evernote as well as taking any other actions you’ve set up. 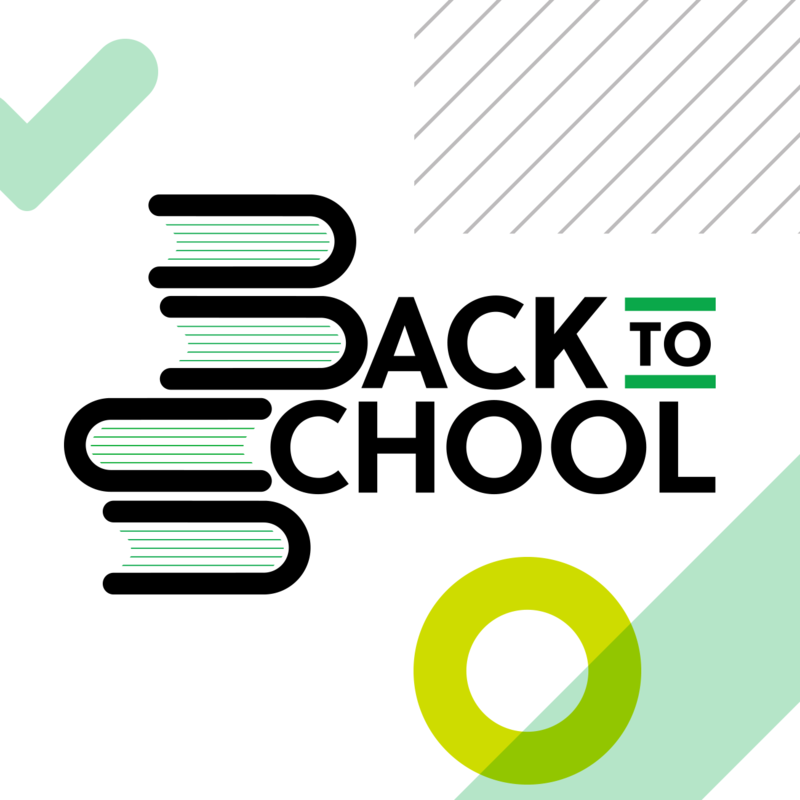 Life moves fast, and you need to juggle projects, information, and ideas like never before. You can easily lose hours switching between apps or entering data, and action items can get lost in all that noise. With Zapier’s new Slack Action, save any Slack message into Evernote alongside the rest of your work, and automatically share it with the other apps you use on a daily basis. Try it for yourself today and see how you can save time and keep everyone on the same page. 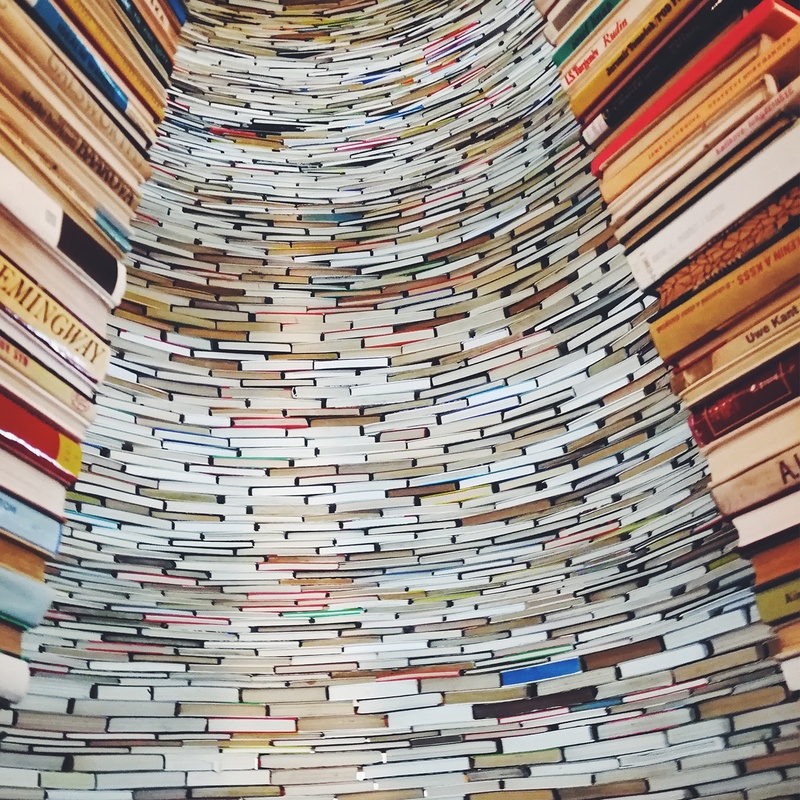 Whether you're an avid reader or writing a book of your own, Evernote is the perfect companion for all your literary adventures. Here’s why.